Jim received his Bachelor of Arts Degree in Communications from the University of Washington in 1998. After working in Career Services at a small college for 12 years, he found that his true calling was physical therapy while rehabilitating from a skiing injury. 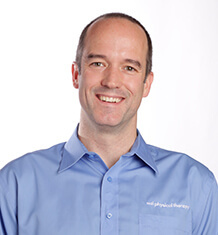 He received his Doctor of Physical Therapy from the University of Washington and began working for MTI Physical Therapy in 2014. His experiences include neurological rehabilitation, oncological rehabilitation, prosthetics training, and outpatient orthopedics. Growing up in California, Belgium, North Carolina and Washington, Jim was a competitive swimmer and water polo player. In his free time, he enjoys running, alpine skiing, surfing, cooking, traveling and hiking.